Fri., Aug. 31, 2018, 1:55 p.m.
NEW YORK – Stocks hardly budged Friday as the U.S. and Canada were unable to complete a trade deal, but the two sides intend to continue negotiating next week. Energy companies slipped along with oil prices Friday and high-dividend stocks also fell. Technology companies and retailers made some modest gains. Trading was very light ahead of the Labor Day holiday in the U.S. on Monday. Investors hoped the two countries would finish the outlines of a revamped NAFTA pact after the U.S. and Mexico announced a preliminary agreement Monday. Right before the markets closed, U.S. Trade Representative Robert Lighthizer said talks will resume on Wednesday. President Donald Trump says he is willing to make a deal with just Mexico, excluding Canada, but Wall Street is confident the final deal will include all three. Katie Nixon, chief investment officer for Northern Trust Wealth Management, said Trump will probably submit the outlines of a U.S.-Canada trade deal to Congress soon. But the trade war between the U.S. and China may drag on for months, if not longer, and Nixon said that could stop businesses from investing and affect the economy and the stock market. “These things will have to be resolved one way or another for investors to regain the kind of confidence it’s going to take to propel the markets meaningfully forward,” she said. The S&P 500 index was down for most of the day but inched up 0.39 points to close at 2,901.52. The Dow Jones Industrial Average fell 22.10 points, or 0.1 percent, to 25,964.82. The Nasdaq composite rose 21.17 points, or 0.3 percent, to 8,109.54. The Russell 2000 index of smaller-company stocks gained 8.40 points, or 0.5 percent, to a record high of 1,740.75. Ford declined 2.3 percent to $9.48 following reports the company canceled plans to import a version of the Ford Focus that is made in China, citing the tariffs proposed by the Trump administration. Otherwise there weren’t many developments on trade, and investors responded instead to the few remaining company earnings reports in the current cycle. Gun and hunting and camping gear maker American Outdoor Brands skyrocketed 43.6 percent to $14.03. The company said sales picked up and it cut costs while offering fewer discounts. The stock erased big losses from earlier in the year. Lululemon Athletica jumped 13.1 percent to $154.93 after it raised its forecasts for the rest of the year following a strong second quarter. Shares in the yoga gear maker have nearly doubled in value this year. Discount retailer Big Lots sank 10.1 percent to $43.05 after its earnings and sales fell short of analysts’ projections. Ulta Beauty kept up with the Kardashians, or at least their half-sister Kylie Jenner. Ulta stock jumped 6.4 percent to $260 after the company announced a partnership with Jenner’s Kylie Cosmetics. It said the brand will be available in its stores and online later this year. Stocks slid Thursday afternoon after Bloomberg News reported that the Trump administration could escalate the U.S.-China trade war next week by putting tariffs on $200 billion in imports. Meanwhile the U.S. and Canada are resuming trade negotiations. The S&P 500 rose 3 percent for the month and the Nasdaq jumped 5.7 percent. Coca-Cola said it will pay $5.1 billion for the biggest coffee company in Britain. Costa has 2,400 shops in the U.K. and about 1,400 in more than 30 other countries. Coca-Cola already owns the Georgia and Gold Peak coffee brands, which make bottled and canned drinks, but the purchase of Costa might be a step toward competing with Starbucks. In the last few years Coke has also acquired a minority stake in sports drink company BodyArmor. Coca-Cola fell 0.8 percent to $44.57. Argentina’s stock index jumped 9.7 percent after a spokesman for the International Monetary Fund said the country has the IMF’s “full support.” The Merval index has climbed over the last two days after the government asked for the early release of $50 billion in rescue funds. The Merval is still down 2.5 percent this year, and the Argentine peso has been trading at all-time lows. Benchmark U.S. crude fell 0.6 percent to $69.80 a barrel in New York. Brent crude, used to price international oils, dipped 0.5 percent to $77.42 a barrel in London. Wholesale gasoline was unchanged at $2.14 a gallon. Heating oil lost 0.3 percent to $2.24 a gallon. Natural gas gained 1.5 percent to $2.92 per 1,000 cubic feet. Bond prices rose early, but faded late in the day. The yield on the 10-year Treasury note remained at 2.86 percent. Gold rose 0.1 percent to $1,206.70 an ounce. Silver dipped 0.3 percent to $14.56 an ounce. Copper skidded 1.7 percent to $2.67 a pound. The dollar rose to 110.97 yen from 110.05 yen. The euro fell to $1.1603 from $1.1663. France’s CAC 40 fell 1.3 percent and Germany’s DAX lost 1 percent. Britain’s FTSE 100 sank 1.1 percent. Japan’s benchmark Nikkei 225 recouped earlier losses to finish virtually unchanged. South Korea’s Kospi rose 0.7 percent and Hong Kong’s Hang Seng fell 1.1 percent. Published: Aug. 31, 2018, 1:55 p.m. 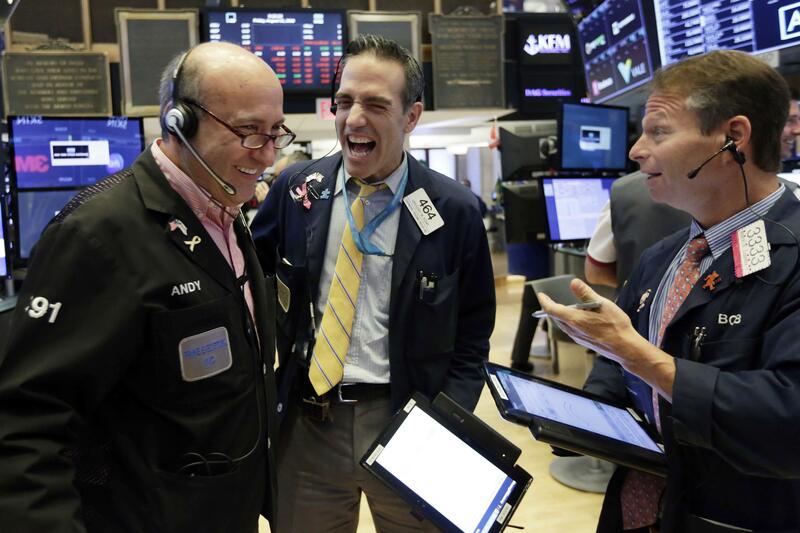 Tags: business, Canada, national-business, news, stock market, trade talks, U.S.